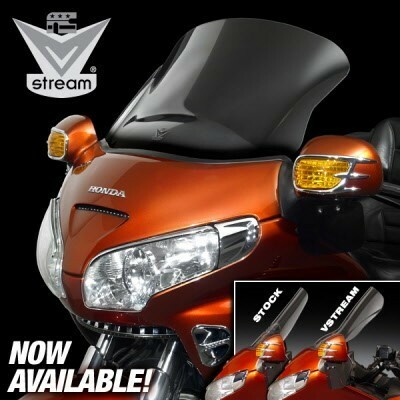 GL1800 Windshield Goldwing GL1800 VStream Replacement windscreen Without Vent Opening N20012The new VStream for the GL1800 features 4.5mm (33% thicker than stock) Lexan® polycarbonate for outstanding optics and impact strength 23X better than acrylic. Then we added our exclusive Quantum™ hardcoat for scratch resistance 10X better than FMR coating and 30X better than acrylic replacement screens. This is one tough windshield! The VStream's larger size and 2.5" setback create a quiet and comfortable ride you're sure to appreciate. Manufactured from thick, sturdy Quantum™ hardcoated Lexan® polycarbonate. DOT approved. Uses existing mounting hardware for a direct replacement. Retains full use of original windshield height adjustment. Both windshields, the ZT-N20012A (with vent opening) and ZT-N20012 (without vent opening), will fit the 2001-09 GL1800. The 2001-05 GL1800 Gold Wing shields use a 5-point mounting system. 2006-09 GL1800 Gold Wing shields use a 3-point mounting system. Our shields are set up with 5-point mounting to fit both 2001-05 and 2006-09 GL1800 Gold Wings. On the 2006-09 GL1800, the customer will use the one middle and two outer mounting points only.